6 St James Hall Chambers have the pleasure of hosting the next GayBar Drinks, inviting all members of the New South Wales Bar Association and Judiciary. Drinks will take place on Thursday, 11 April 2019 at 5.30pm – 8pm at Level 6, 169 Phillip Street Sydney. Andrew Pickles SC, NSW Bar Advocate for Change will give a few words of welcome. The first session of the New Barristers’ Committee 2019 Cross Examination Workshop was held on 21 February 2019 and is now available of CPD Online. To view the seminar please click here. The seminar conducted by Michelle Painter SC (9th floor, Selborne Chambers) and Marcus Pesman SC (Queen's Square Chambers) discussed cross-examination technique. View the Conference flyer here. The Law Council of Australia have today issued a media release stating the Federal Government’s failure to respond to the Australian Law Reform Commission’s (ALRC) Pathways to Justice report is disappointing and demonstrates a lack of appreciation as to the difficulties faced by generations of Aboriginal and Torres Strait Islander people, which we are all responsible for as a nation. The President of the New South Wales Bar Association, Tim Game SC has today issued a media release stating Federal and State governments must unite to address the appalling rates of Indigenous imprisonment in this country. “A year ago the Australian Law Reform Commission released its Pathways to Justice Report, which recommended a suite of reforms aimed at reducing Aboriginal disadvantage in the justice system. Yet, twelve months on from the ALRC report, we have not seen any commitment from Federal or New South Wales Governments to implement and properly resource the report’s recommendations” Mr Game said. Later today Stephen Gardiner of Waratah Chambers embarks on a charity car event proudly supporting Beyond Blue to help achieve a greater awareness of depression, anxiety and suicide in our society. They will venture over 1400kms between today and Monday 1 April 2019 to help spread the word that we do not have to fight mental illness alone. The rally raised in excess of $300,000.00 last year. If you can I am asking that you help support Beyondblue to continue their work. All donations go directly to Beyondblue as participants in the rally pay their own way. Donations can be made here. Join the Black Dog Institute for their inaugural Exercise Your Moodwalk. This new event will take place on Saturday, 4th May 2019. You can choose to walk* either 5km or 10km through scenic Centennial Parklands, Sydney, and start a conversation about mental health. Bring your friends and colleagues, meet our celebrity ambassador Michelle Bridges and fundraise $100 for mental health. By walking and raising funds, you will support vital education programs provided to schools, communities and medical professionals. You'll help change the statistics and remove the stigma around mental illness. Members can receive the 2019 Quadrivalent influenza vaccine on Tuesday, 2 April 2019, between 4.00pm and 6.00pm in the Common Room. Information about the vaccine is available here and here. A consent form, which must be completed and presented on the day, is available here. The cost to members will be $22 (inc. GST). In addition, members can take the opportunity to have a 10-minute executive health check (cholesterol, diabetes, blood pressure) - performed by a registered nurse, for an additional $27.50 (inc. GST). Register here for the 2019 flu vaccination and / or a 10-minute executive health "Instacheck". For more information, please email the coordinator of services and benefits, Chris Winslow. Flu vaccinations and instant health checks are initiatives of the Wellbeing Committee of the New South Wales Bar Association. John Gray Spencer, a former Barrister of Samuel Griffith Chambers, died on the 24th of March 2019. Mr Spencer came to the bar on 5 September 1980 and had a distinguished career at the criminal bar. The Voices for Justice Annual Dinner honours courageous individuals who speak out where there is silence. Further to the previous Family Law Amendment issued on 12 March please find attached here a further update received from the Attorney General's Department today. The amendments protect victims of family violence by banning personal cross-examination in certain circumstances in family law proceedings, and requiring instead that cross examination be conducted by a legal representative. The amendments will apply to hearings from 10th of September 2019, in proceedings instituted before or after that commencement. The Law Society of the Northern Territory and Law Council of Australia have today called on the Gunner government to honour its commitment to replace the Don Dale Youth Detention Centre with a new purpose-built facility as a matter of urgency. The Royal Commission into the Protection and Detention of Children in the Territory, released in November 2017, recommended Don Dale be closed and replaced to protect the safety and rights of children in detention. The NT Government promised to implement all 227 Royal Commission recommendations, however, a year on Don Dale remains. On 25 March 2019, President Tim Game SC appointed Andrew Pickles SC as a NSW Bar Advocate for Change for a period of three years. The purpose of the Advocates for Change program is to provide role models who are excellent practitioners and who, through the example of what they do and say in their professional lives as barristers, represent the full width of diversity and inclusion that the NSW Bar Association wishes to promote at the Bar. Through Andrew’s work at the Bar and the NSW community has demonstrated a commitment to LGBTI diversity and inclusion and it is hoped that his appointment as NSW Bar Advocate for Change will contribute to the advancement of LGBTI inclusion and diversity at the NSW Bar. As an Advocate for Change, Andrew has agreed to participate in the formulation of strategies to promote equality, diversity and inclusion at the NSW Bar. There may be three Advocates for Change serving at any one time. He joins Advocates for Change, Jane Needham SC and Hament Dhanji SC who were appointed in June 2017. More information about the NSW Bar Advocates for Change program can be found here. A ceremonial sitting of the FairWork Commission, to welcome new members, Deputy President Gerard Boyce and Deputy President Bryce Cross, will take place on Tuesday, 26 March 2019 at 4.30pm in the Hearing Room 15.1, Level 15, at Terrace Tower, 80 William Street, East Sydney. Members are invited to attend. 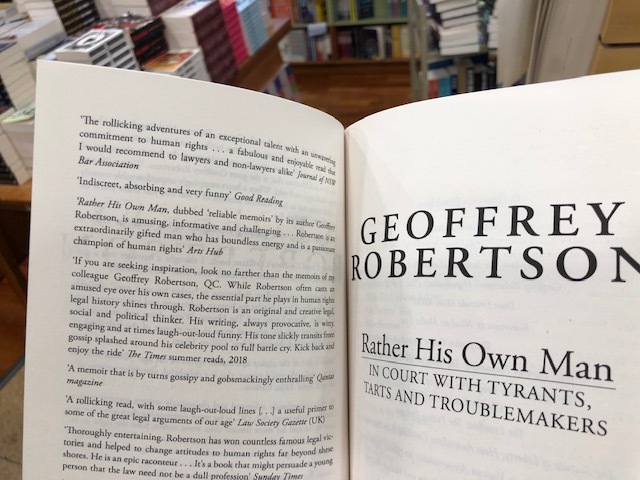 The Spring 2018 edition of Bar News featured a book review by Anthony Cheshire SC of Geoffrey Robertson's Rather His Own Man - Reliable Memoirs. Anthony described it as "the rollicking adventures of an exceptional talent with an unwavering commitment to human rights ..." This was picked up by the publishers, who were obviously pleased enough to quote Anthony at the top of its list of reviews on the verso.